The US Men's national team defeated South Korea yesterday in a tune-up game for the World Cup that also served as the end point for the January camp. It was an all around good showing for the squad and a few questions were raised, positively. 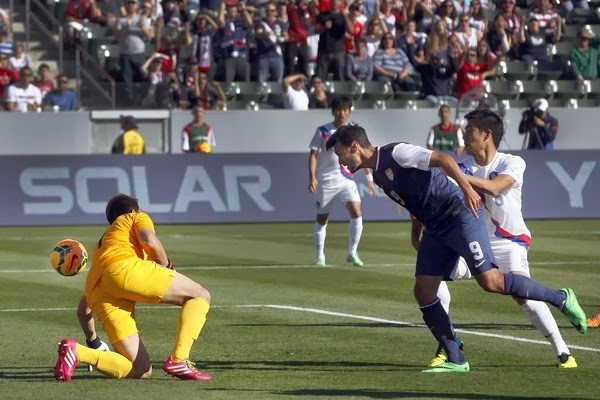 It is nothing new to see Chris Wondolowski scoring poacher goals. Scoring them internationally has been a bit more difficult when facing more relented sides. Although South Korea is a step up from say, Belize, it is still no Ghana or Portugal or Germany. And yet his poaching, right moment at the right time style might just be enough to send Wondo to Brazil. Yesterday we wanted to see something breathtaking from players vying for a spot in 2014 and a sort of accreditation for those we know to be on the plane regardless of what happened on the pitch. We wanted Yedlin to light it up in the right side, for Luis Gil to create plays and score goals, for Brad Davis to score a free kick and for Mike Magee to show why he's one of the top players in MLS. We wanted to see some Diskerud magic, solidification of the Besler-Gonzalez partnership and settling the question that is Zusi or Donovan. We got very little time to see Yedlin, although he looked self-assured. Luis Gil was unfortunately rarely visible. Brad Davis played well but didn't make enough of a dent to assure a spot in the final 23. For many fans out there, Mix Diskerud was who they wanted to see. But they wanted the magic of the Gold Cup games, the Russia game and, especially, the Mexico game. Instead we got only flashes. And this is because of the type of midfield Klinsmann prefers, a flank-friendly and interchangeable attack type of soccer. Diskerud approaches more of a Number 10 role in his inventiveness and positioning. For all the praise deserved by Wondolowski, most of the attack really came from Graham Zusi. His play led to Wondo's second goal and he was active defensively and offensively, winning balls and serving lofted and grounded plays. Indeed, you can expect him to remain with the squad, if not a starter, when June comes around. Sporting Kansas Ciy didn't just give us Zusi, it also gave us Matt Besler. He partnered well with Gonzalez at center back and cleaned up messes left behind by Brad Evans, who may be seeing his right back spot slip away. The team moved as a unit yesterday but still lacked enough offensive bite, something we hope Dempsey, Altidore, Bradley and Johannsson can bring. The back line had some scares, and that's where it gets interesting. As Alexi Lalas pointed out: "Ghana will score on those plays." Indeed. What will happen with Chivas USA?